Clear skies. Low around 60F. Winds N at 10 to 15 mph..
Clear skies. Low around 60F. Winds N at 10 to 15 mph. Clyde walks through the grass. Wildlife care staff set up the set. A cameraman sets up the ocelot exhibit. This film, produced by Ben Masters, explores the idea of what impacts a border wall would have on people, the land and, of course, wildlife. In this film, five friends embark on a 1,200-mile journey from El Paso to the Gulf of Mexico. They set out to understand what building a wall would do to the landscape. Along the way, they interview people and encounter wildlife. The trail is rugged, it is wild, and it is beautiful. Building a wall will have a lot of negative consequences for both people and wildlife. Wildlife that would be greatly impacted by a wall include ocelots. 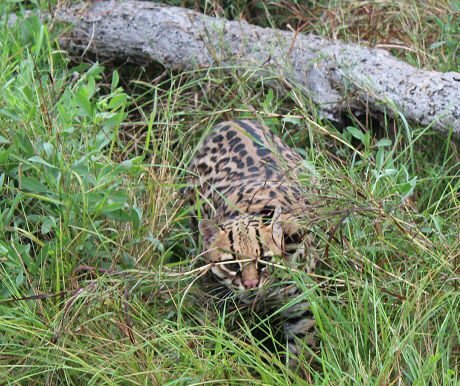 Biologists at the Laguna Atascosa National Wildlife Refuge track wild ocelot in the refuge and the area. Currently, there are about 50-80 wild ocelots. These ocelots are a subspecies found on both sides of the boarder. In terms of ocelot longevity in this area, a wall would stop gene flow of the species, which would have devastating effects on the ocelot. Keeping the area open for animals to travel back and forth is critical for their survival. When the Texas Zoo was approached to film our ocelot for this documentary, we were thrilled to be a part of an exciting project that we support. Ocelot conservation is a major priority at the zoo, and we were very happy to comply. Because wild ocelots are so difficult to film, we recreated a natural ocelot habitat in our exhibit. We filmed for two nights. The film crew set up inside the exhibit, and then we would let Clyde, our male ambassador ocelot, out for them to film. Clyde was our star. He is so photogenic and gave the crew many great clips. He made the filming easy. The official trailer for “The River and the Wall” has a quick shot of Clyde in it. The film won the SXSW – Louis Black Lone Star award for best film in Texas and will be shown in theaters nationwide May 2. We are looking forward to viewing the movie in its entirety and looking for Clyde. Elizabeth Jensen is the executive director of the Texas Zoo. The Texas Zoo is in Riverside Park, 110 Memorial Drive. It is open from 9 a.m. to 5 p.m. daily except Thanksgiving, Christmas Eve, Christmas Day and New Years Day. For more information, call 361-573-7681 or visit texaszoo.org.